Well we made it Jackson Hole with my dad and brother, they did 10 days hiking without a rest. 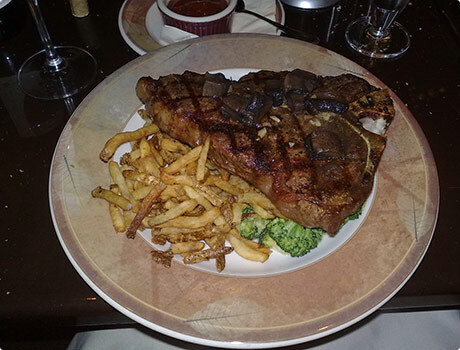 To celebrate we went out for a steak obviously, largest they had on the menu was the 36oz Porterhouse. Pretty damn fine piece of meat, one of the best, certainly one of the biggest! Rest of the meal let it down though, wine was rubbish and they kept bringing us the wrong ones (got a free one out of them in the end though) and the apple pie was a bit average. But a good time was had by all, I even feel a tad hungover today. Aug 27	This entry was posted in CDT by cookie. Bookmark the permalink. Thanks for the good writeup. It in reality used to be a enjoyment account it. Glance advanced to more delivered agreeable from you! However, how could we keep up a correspondence?